The stairs of your church could be preventing practicing parishioners from attending your services. Our stairway lifts make your place of worship more accessible. With straight or curved stairway options, we can find a solution for any staircase. Public accessibility can be achieved with budget conscience solutions. 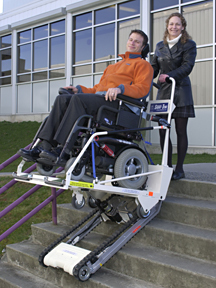 Wheelchair lifts allow travel up and down the stairs without the construction or cost of an elevator shaft. Suitable for indoor or outdoor use, our wheelchair lifts also offer more safety features than any other wheelchair lift. Syracuse Elevator knows you value all your church members equally, and care for them personally and individually. That's why it's important that all your members feel welcome. That welcome feeling is attainable only through equal, easy accessibility. Portable lifts can be used on an as-needed basis, and can help your followers access your entire church.